Can Copenhagen save the planet? New Delhi: India must clearly convey it is not part of the problem but position itself as a problem solver." That is the advice offered from Veerabhadran Ramanathan, head of the US Climate Change Science Program and one of the world’s premier climatologists, as the last chance to save a historic 12-year-old global agreement, and the planet from overheating, begins Monday in the Danish capital of Copenhagen. 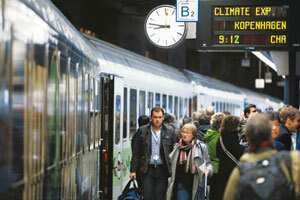 “Within two weeks from Monday, governments must give their adequate response to the urgent challenge of climate change," said United Nations Framework Convention on Climate Change executive secretary Yvo de Boer. “Negotiators now have the clearest signal ever from world leaders to craft solid proposals to implement rapid action," he added. The Indian delegation of 26 officials, four members of Parliament, four children and Ramesh himself joined delegates from 192 nations as hope grows—where there was none until last week—for at least a tentative agreement at CoP-15, the official term for the Copenhagen meeting, the 15th Conference of Parties, to negotiate a new global climate treaty to replace or extend the 1997 Kyoto Protocol beyond 2012. Over the last week, three of the world’s four top polluters—China, India and the US— announced emission targets. If you thought India’s last-?minute change of stance was radical, consider that elsewhere too diehard opponents to change are changing. In the US, the prime naysayer to a global agreement, Republican senators are starting to back US President Barack Obama, who will join 100 other heads of states, including Prime Minister Manmohan Singh, at the close of the 12-day summit. “To deny the mounting evidence of climate change is to stick our heads in the sand," wrote senator Robert Byrd, a 92-year-old coal industry backer and the longest serving member of the US Congress (50 years in the Senate alone) in his local newspaper two days ago, surprising everyone who thought he was a guaranteed “no" vote to Obama’s efforts to push through a climate and clean energy bill next year. Last-minute hopes are now prompting a surge of people towards Copenhagen, a city of two million that ran out of its 17,600 hotel rooms more than three weeks ago and is now selling tickets of the inaugural ceremony to even accredited media, hoping to restrict numbers. Rajendra Pachauri, chairman of the Intergovernmental Panel on Climate Change and head of The Energy and Resources Institute, Delhi, was one of three speakers (Denmark’s Prime Minister and Copenhagen’s mayor are the other two) at Sunday’s opening ceremony at the Bella Centre convention hall in Copenhagen. Press accreditation—5,000 journalists have registered— was suspended eight days ago, “due to the huge amount of accreditation requests received that exceeded the capacity of the conference centre (capacity: 15,000)", said a notice issued on Sunday by the UN. The options: daily podcasts on YouTube; Facebook, Twitter and Flickr links; royalty-free photographs and special websites for iPods, mobile phones and personal digital assistants. Aside from CoP-15, there are several sideshows by special interest groups, business, non-governmental organizations and more. The largest is Klimaforum, the “people’s climate summit", which will feature groups from Ghana to Ghaziabad, Denmark to Dharamshala, Nigeria to Nagpur. One of the keynote speakers is Indian ecowarrior Vandana Shiva. With Western companies expected to play the major role in translating any agreement, Copenhagen is also proving to be an unparalleled business opportunity. It’s also one reason why the host country is leading an aggressive stand that will push India and China to accept emission cuts. Last year, in the midst of the financial crisis, Danish energy technology exports rose by 13%, twice as much as other exports. A UK government estimate puts the value of the global market for green technologies at $4.9 trillion (Rs226.9 trillion). Tens of Indian companies (there’s no accurate count) are sending executives. The lucky ones will pay $300 a night for a hotel room; others are asking friends to persuade their friends in Copenhagen to spare a bed. Back in the Indian delegation, they are preparing for long, hard negotiations with a fresh, new approach. “India must listen more and speak less in negotiations, or else we will be treated with disfavour and derision by developed countries and resented by small island states and other highly vulnerable countries," advised Ramesh in a 13 October letter to the Prime Minister, the misquoted version of which started the public debate over what is now India’s flexible new stand. As Ramanathan said, India may not be part of the problem, “but given its population and its current growth rates— and given its great vulnerability to climate change—it has to be part of the solution".